HEAVIER loads in wheelie bins up to 75kg -- the maximum load recommend by wheelie bin manufacturers -- can now be easily handled by the new heavy duty Litta Lifta made by EP Draffin Manufacturing . Remote control and a powered hydraulic system ensure Litta Lifta is easier, safer and faster to operate. Litta Lifta runs smoothly on high quality heavy duty castors, which feature castor locking brakes. It features a low voltage lifting power system along with a high quality charger as standard. Safety features include a clearly audible warning signal, which sounds during lifting and emptying operations, and mesh safety guards to prevent incorrect entry. 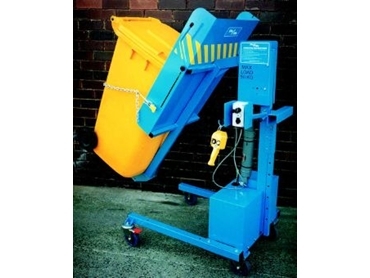 Litta Lifta easily lifts wheelie bins over 1600mm high for emptying into large dump bins. An extensive range is available including a budget priced hand-hydraulic model.